Primavera was essentially inspired by female characters of the Early Renaissance era from Sandro Botticelli’s paintings, and “Birth of Venus” (“Nascita di Venere”, 1482—1486) first of all. I have the most devoted feelings for Sandro Botticelli’s paintings and maidens pictured in them. Their images hold so much depth, dignity, tranquility and wisdom, so that sometimes it’s impossible to tear oneself away from their faces and one can contemplate them for hours. 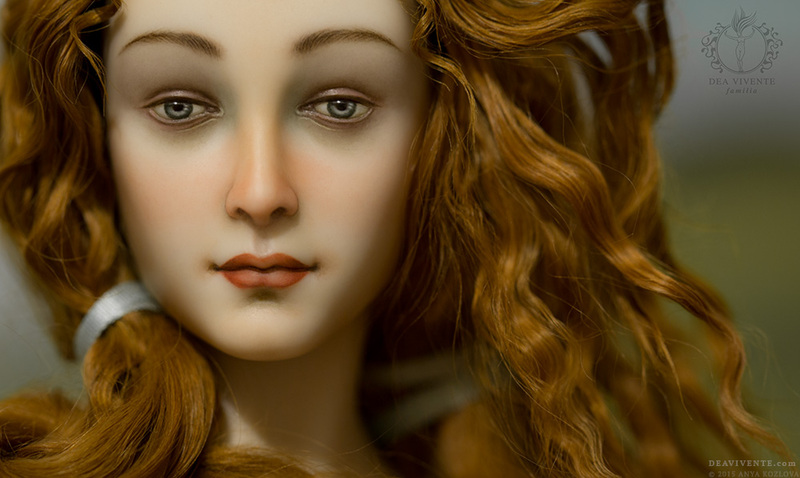 The doll’s name gives a hint to another well-known painting of Botticelli’s – “Allegory of Spring” (“Primavera”). The face mold “Taiga” served as a base for Primavera’s face, but to get more similarity with Venus the face sculpture was deeply modified right on a porcelain cast. Modifications affected all the areas: eyes, eyebrow ridges, nose, lips, cheeks and cheekbones, chin. 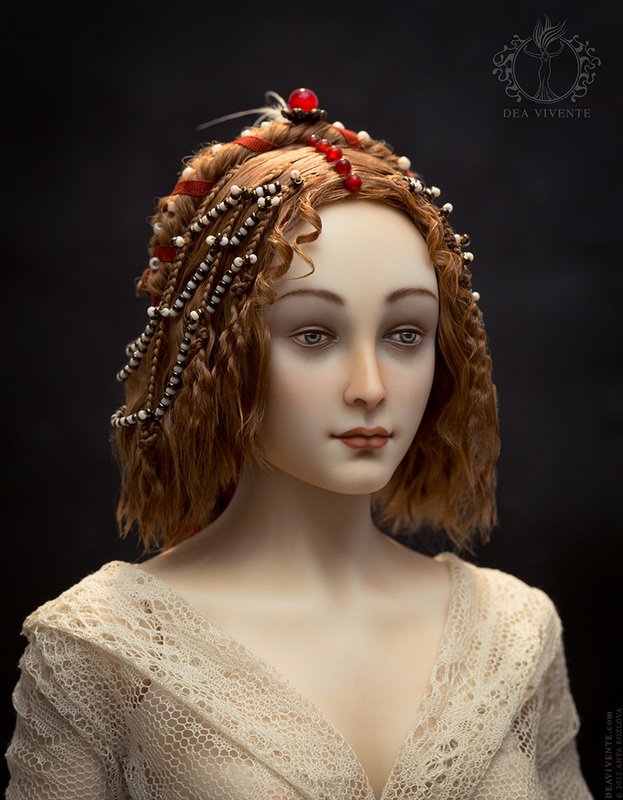 Light tone of porcelain gives the doll the particular tenderness and elegance of pale skin incident to classical images. To imitate pictorial art, I’ve chosen warm colour gamma while painting Primavera and have made very soft and delicate tone transitions. For the wholeness of the character representation, I painted a background with brushes that corresponded to the doll’s spirit and represented the atmosphere of “Birth of Venus”. For the sake of similarity with tempera painting I used artists’ acrylic paints. This canvas served as a base for the doll’s photo-session and for making a photo-painting “Nascita di Primavera” (“Birth of Primavera”, 2015). 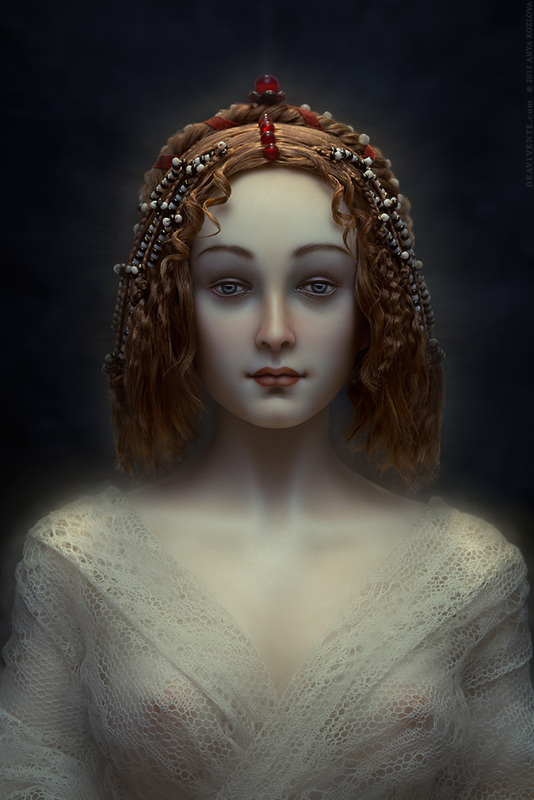 One of Primavera’s wigs imitates Venus’s romantic hairdo with varying length of hair: short wavy locks at the front near the face gradually turning into thick locks coming down to the knees. 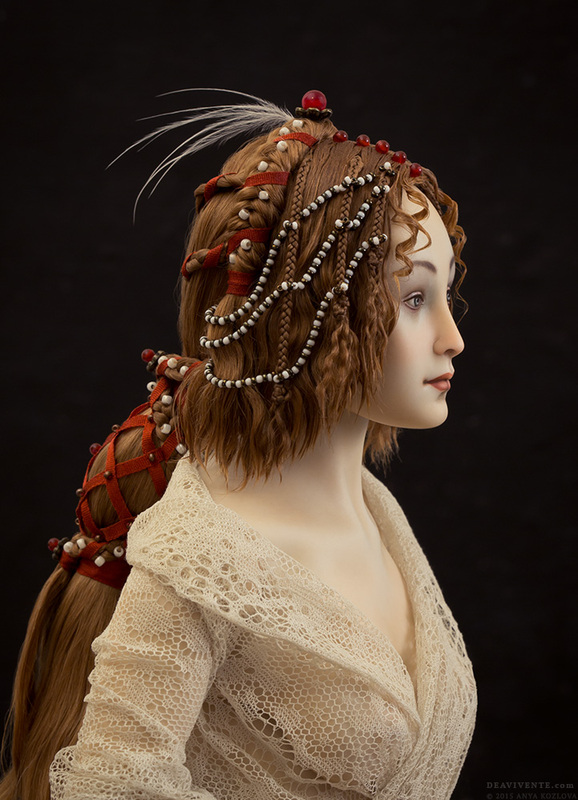 The second wig represents a Renaissance era hairdress. 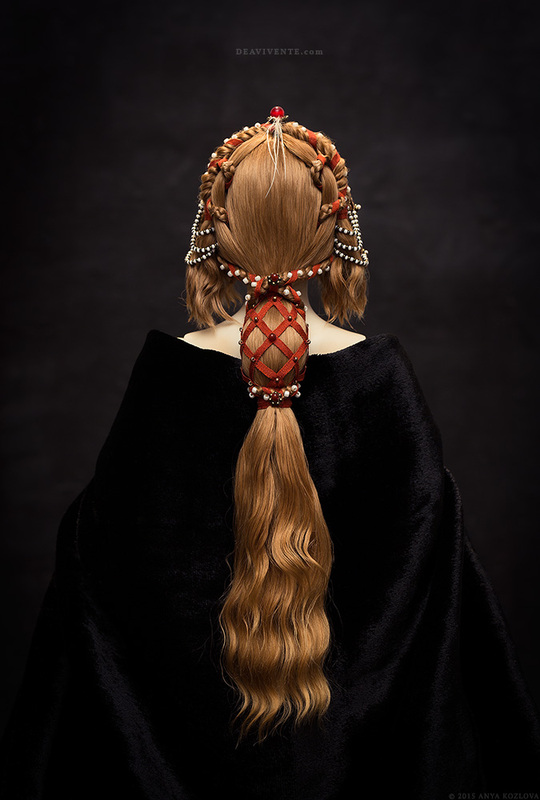 It was inspired by one of Botticelli’s canvases as well, depicting the artist’s eternal muse Simonetta Vespucci. I’ve incorporated certain changes into this hairdress to my taste, and some of them were dictated by the wig’s small scale. 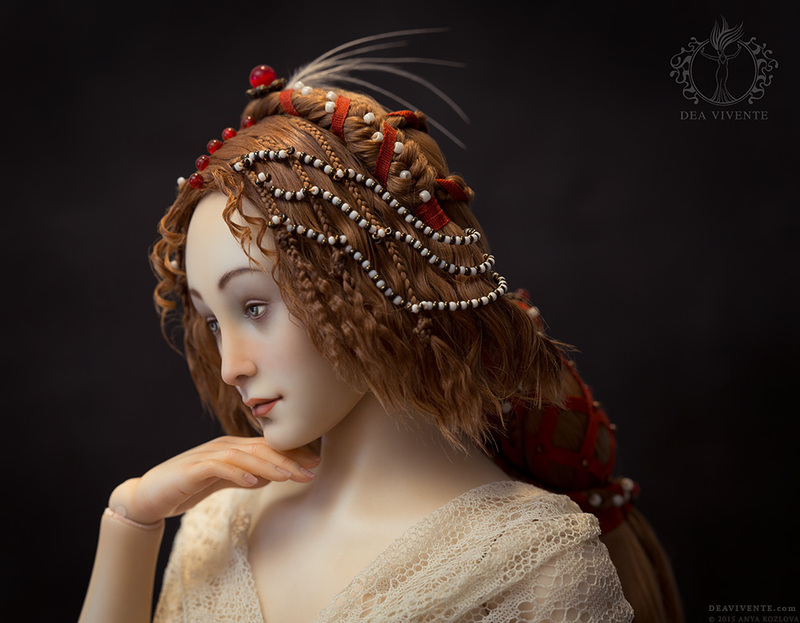 For this work beside hair I used some other kinds of materials: coral beads, glass beads, silk ribbons, feathers, accessories.